Despite the locks, security cameras and other features present on college campuses, security is often hard to come by in a dorm room. Small things are easily stolen, and the number of people who come and go in a given day means many opportunities for theft to occur. While a secure compact safe may not prevent the most determined of thieves from accessing your valuables, it can make casual theft much more difficult. The Stack-On PDS-500 has the size and features to combat theft in a dorm, but can it really keep your important items safe? Check out my Stack-On PDS-500 review to find out. Unlike many other safes, the Stack-On PDS-500 is designed primarily to be used inside a drawer or cabinet. At 11.8-by-8.6-by-4.2 inches, the PDS-500 is built to rest on its back, and as such it’s considerably shallower than many other personal safes. A steel body with pre-drilled mounting holes and hardware allows you to bolt the safe to a drawer, cabinet or other sturdy surface for added security. While many campuses are going to frown on you doing this, you can also use a cable lock to secure the safe by wrapping the lock around a solid object. 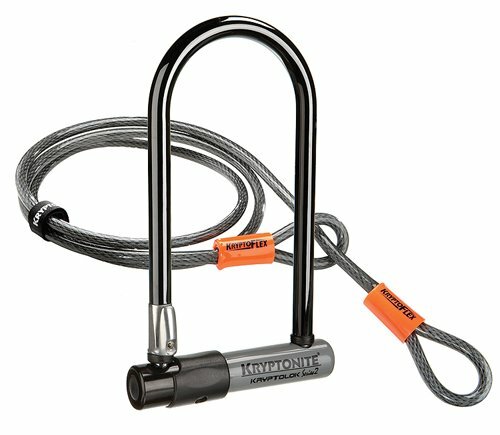 The holes in the back of the safe are small so you will want to use a smaller lock such as the Master Lock 8417D Python Adjustable Locking Cable, 6-Foot. The safe features a pry-resistant, solid-plate steel door with concealed hinges, which is secured by two live action steel locking bolts. The lock is operated by a keypad mounted on the door, along with a backup override key which is hidden under a panel on the front. The Stack-On PDS-500 features an electronic keypad lock, which can be programmed with a passcode of your choice. The code can be between three and eight digits long, and it can be easily reset or changed by opening the safe and pushing a red button on the rear of the door. The red button kept falling out into safe which was a minor annoyance. The keypad includes an option for silent number entry where stealth is preferred, or the keypad can be programmed to beep when used. 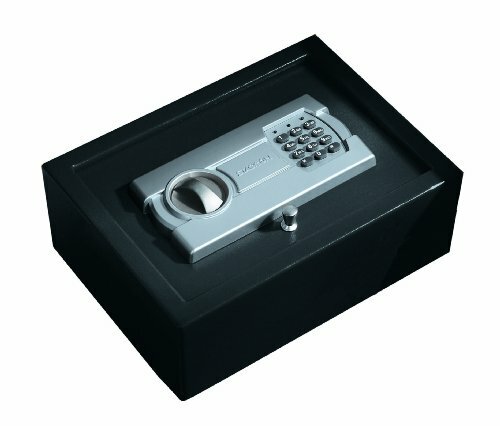 A backup override key is also included for manually opening the safe in the event the batteries expire, and the key hole is concealed behind a small plastic latch on the front of the door. A small light on the door indicates the status of the batteries. There’s little not to like about the Stack-On PDS-500, but the safe may not offer enough storage space for everyone. Because it’s built for storage inside a drawer, the safe is going to be shallow. While the body of the safe is quite well-built for the price range, it may not stand up to a determined and well-equipped thief. Additionally, the keypad is constructed from plastic and may be vulnerable to damage. The red button came off constantly on my safe and with it’s small size, it could get lost easily making it inconvenient when it comes time to reset the safe. Although the safe is not impenetrable, it does provide solid and reliable security for the price. The safe is best for when it is hidden in a desk drawer. The way the door of the safe opens lends itself to that orientation. The Stack-On PDS-500 is the perfect safe to hide in a desk drawer with it's top open design. With excellent build quality but limited practical applications when in a dorm room, resulted in the lowest score of the safe reviews.